Remember the Salsa Verde, it makes a lot doesn’t it? The benefits are that I have enough for dipping and also to make burritos. Cameron, my youngest son loves burritos and since he was nice and asked me sweetly, I said okay. I made the Salsa Verde ahead because it takes some prep time and it’s easier to have it on hand and ready to go. You can make burritos with chicken or ground beef but today I’m making pork. Usually I put a pork roast in the crock pot and leave it all day, but I just got a new dutch oven that I’m dying to try out. 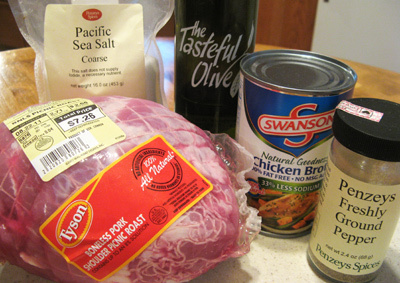 Try to find a cheap pork roast with as little fat as possible. I found a 2 3/4 pound boneless roast that was just about perfect for a dozen burritos. I used the dutch oven, but you could certainly use a crock pot. Drizzle some olive oil into a hot dutch oven. 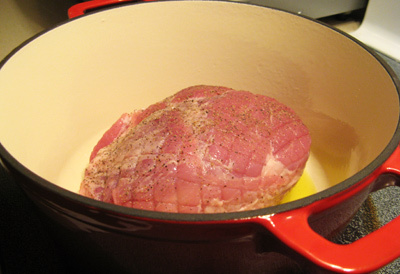 Season the pork roast with salt and pepper and place in dutch oven to brown. Brown the roast on all sides to get that caramelized look. 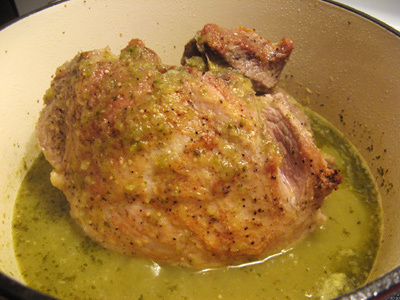 Add the can of chicken broth and 1 1/2 cups of the Salsa Verde into the dutch oven to cook along with the roast. Cover the dutch oven, turn the temperature down to between low and medium and simmer for a couple hours. The juices are starting to flow now. I ladled some of the sauce over the roast, turned the heat down to low and covered it again for another couple hours. After 5 hours, it’s starting to fall apart. I transferred it to a bowl and pulled it apart with 2 forks. It was juicy tender and came apart so easy. You can taste the seasoning and salsa flavors coming through the meat. 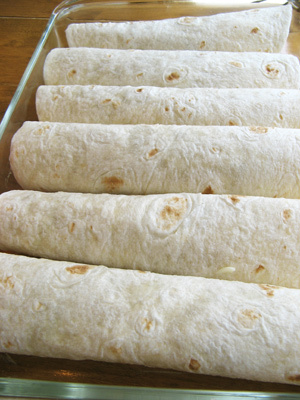 Time to put the burritos together. 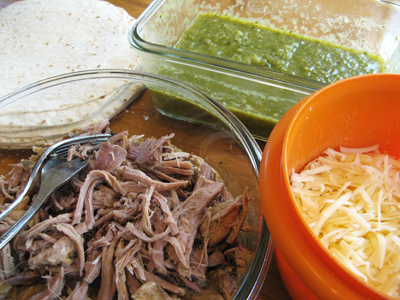 I have flour tortillas, shredded pork, Monterey Jack cheese and 2 cups of Salsa Verde left. Lay the tortilla down flat. Heap some shredded pork meat and cheese over top. Roll up and place in a 9 x 11 inch cake pan. Should be room for 6 burritos in each pan. Line them up just like this. Ladle a spoon full of sauce over each burrito and top with cheese. 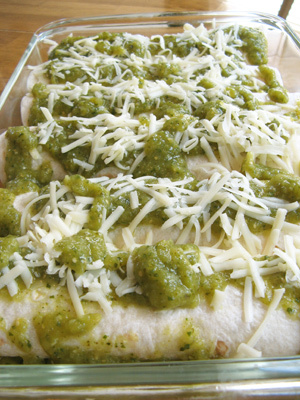 Place them in a pre-heated 350 degree oven for 15-20 minutes or until cheese has melted. Time to serve them up with your favorite toppings. 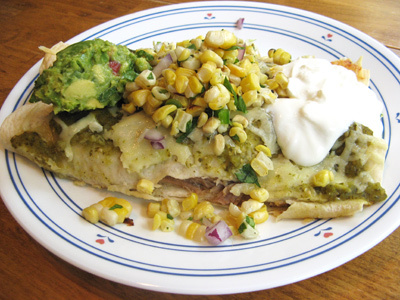 As you can see, Cameron loaded his with guacamole, roasted corn salsa and sour cream. He started with 2 burritos and then came back for 2 more. Drizzle olive oil in a hot dutch oven. 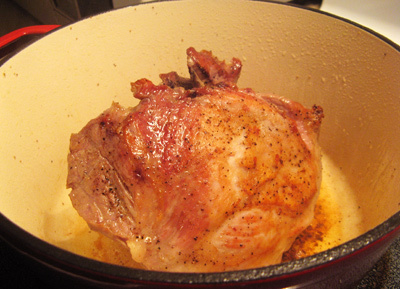 Season pork roast with salt and pepper and place in the dutch oven to brown on all sides. 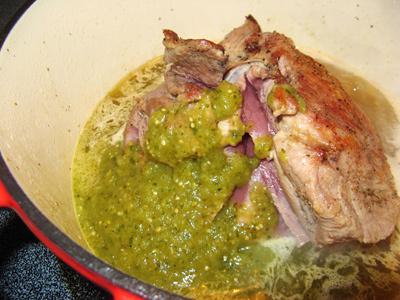 Add chicken broth and 1 1/2 cups salsa verde to the dutch oven, cover and simmer over medium low heat on the top of the stove for 2 hours. Check the roast, turn it and ladle sauce over top. Cover and continue cooking 2 – 3 more hours over low heat. 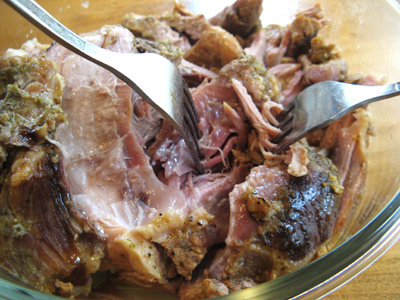 When the roast starts to fall apart, transfer to a bowl and using 2 forks pull the roast apart in shreds. 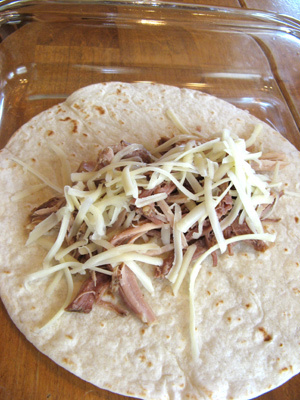 Fill each flour tortilla with a portion of the shredded pork and monterey jack cheese. Roll up and place in a (2) 9 x 13 inch cake pans. Make 6 burritos in each pan. 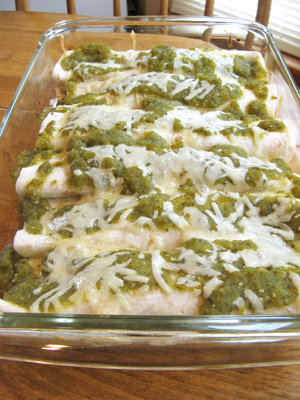 Spoon a ladle full of salsa verde over each burrito and top with more grated cheese. Place in a 350 degree oven for 15 – 20 minutes or until cheese melts. 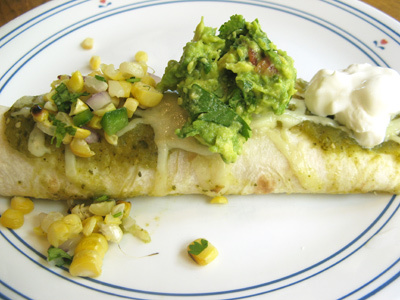 Serve with favorite toppings, such as sour cream, guacamole, green onion, cilantro, or roasted corn salsa.